In large mixing bowl combine wet ingredients using water that is room temp to warm, but no warmer than 80 degrees Fahrenheit, also adding yeast and sugar, and salt. Next, slowly stir in flour using finger tips until flour begins to form into a solid ball. Let dough rest for 8-10 Minutes covered with plastic or a damp cloth, allowing the gluten to relax, making your job easier. After dough has rested continue to knead on surface until it forms a smooth ball. Let Rise for 1 hour, covered in floured bowl, or on counter. Once dough has doubled in size, divide into 135g sized pieces. Pre-shape strands and let rest for 10 minutes, covering with cloth or plastic wrap to avoid dough drying. Once rested shape into Bagel and allow to proof on a pan floured with Cornmeal. Ensure that your oven should be preheated to 500 degrees Fahrenheit and bring water to a boil on stove while proofing. For crust texture, color and flavor add malt syrup approximately 3% water weight. Once bagel pass fingerprint test drop a bagel in to boiling water, allow to boil on both sides for 30-40 seconds. Remove from boiling water and place on sheet pan lined with parchment. 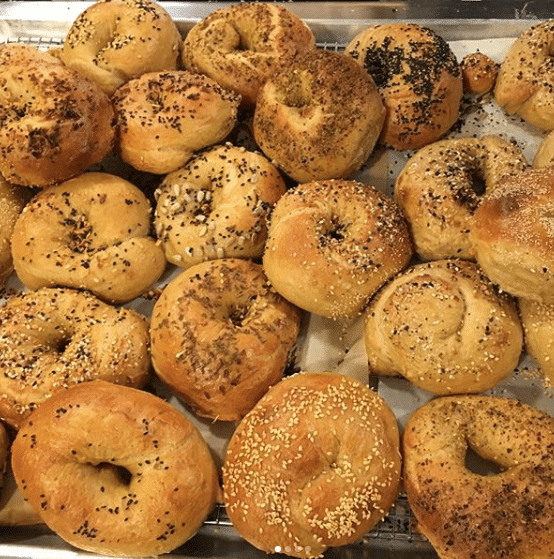 After all bagels have been boiled you may decorate them with seeds as you see fit. Or toss bagel into seeds immediately after boiling for full coverage.